All-steel construction with convenient handle and side storage pocket. Top basket holds legal-size folders. Bottom shelf with lip holds packages and supplies. Mobile on 3"" front casters and oversized 8"" rear wheels. Color: Black/Silver; Capacity (Weight): 300 lbs. ; Caster/Glide/Wheel: Two 3"" Front Casters, Two 8"" Oversized Rear Wheels; Material(s): Steel. 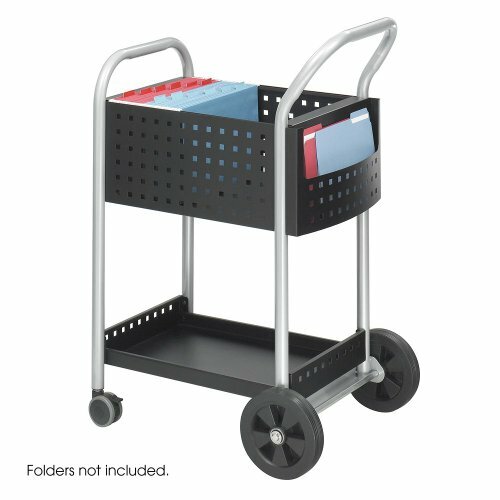 Steel mail cart with top file basket, side storage pocket and bottom shelf. All-steel construction with unique hole pattern design. Convenient handle and side storage pocket. Top basket holds legal-size folders. Bottom shelf with lip holds packages and supplies.